I was going to give up on felt-tip liquid eyeliners after using so many of them that the point dries out even before I finished my line. Surprisingly this one didn't--at least not so much. It's not the best but still pretty decent. The formula comes out precisely and it's so easy to create thick or thin lines with this product without it budging or tugging on your lid. I also like how the tip does...read moren't feather like most felt-tip eyeliners. The black is intense and lasts a long time. It is much easier to create cat eyes and winged liners with this liner compared to the NYX Curved liner. 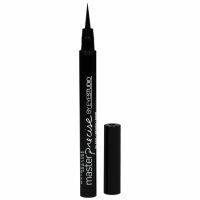 This is a great, budget-friendly liquid eyeliner. The applicator comes to a fine point, making this really easy to use. The black is not shiny like many liquid liners tend to be. This also does not flake off or run so it is super long lasting and easy to wear, whether you create a subtle thin line, or a more bold line or a winged look. Many of the pen type eyeliners can dry out really quickly ...read morebut this one has lasted a suprisingly long time. I forgot about this for a couple months in my makeup case and I tested it thinking it wouldn't be good anymore, but it was just like new! Very impressive for a drugstore liner. This liner is really worth it. I like to do the 60s style wings and this is my favorite liner to do this with. Stays on all day too!